Why theater? : As a child I had given up on theater because I've always been a big girl and from second grade, getting passed for Mabel (the lead) and given the part of Ruth (the maid) in Pirates Of Penzance - I made a mental note. There's no future for me in this because I'll never get the lead...and I wanted the lead. Fast forward 17 years, after a career behind the scenes as a television editor, I decided stand up comedy was an arena where I potentially could exist because sometimes the weirder you look the more of an advantage you have. Being a big girl could be something I embraced on stage and I was the lead (because no one else is there)! Through comedy I relearned how much I love to perform and interact with an audience. I love the energy that is shared during a live performance. It's palpable, it fuels me. I feel seen in a way I don't feel seen in my daily life. 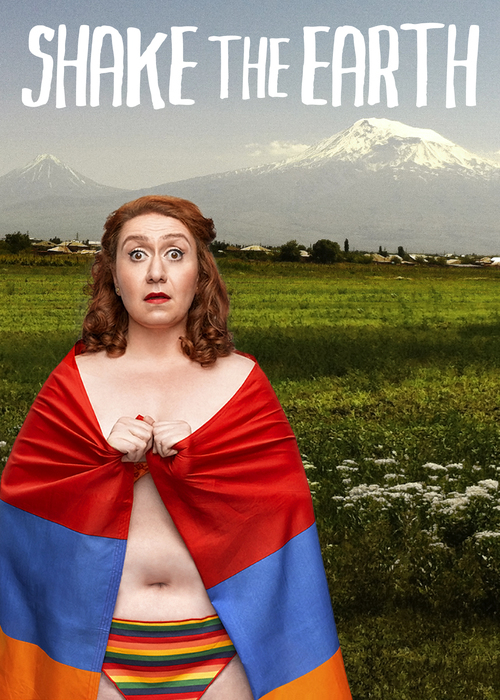 Tell us about Shake The Earth: Shake The Earth is a solo show that hinges on the tension between Armenian and gay pride. Bolstered by kufta and string cheese, Lousine yearns to be a good Armenian and defender of her ancestors who survived the Genocide. But, as a lesbian, she may be the last person her great-grandfather Georgi--and most of their countrymen--would want to give the account of his remarkable story of survival. Driven by the 100th anniversary of the Armenian Genocide, which the Turkish government consistently and aggressively denies, Lousine finds the courage to speak. What inspired you to write Shake The Earth: If there is one thing I do before I die, it is this show, Shake The Earth. I developed it in Matt Hoverman's GoSolo class because I felt this burning desire to bring the injustice of the Armenian Genocide and Turkey's active denial to light. This year marking the 100th Anniversary of the Genocide and Turkey’s continued denial put a fire under me. I never intended on including my own coming out story but I was convinced by Matt Hoverman to push through and do it. Now I see the power in combining my great-grandfather's escape from a work camp in Turkey and my struggle with finding my identity and voice as a gay person in a very traditional immigrant Armenian home in Brooklyn. We have a long way to go when it comes to gay rights in Armenia and within the Armenian community. And I think for a country like Turkey which still aggressively tries to repress the minorities within its borders (minorities being Armenians, Kurds, Assyrians or the LGBT community), they should be held accountable for their past. Turkey should have to face it. That's my mission with this show, to educate an American audience on a piece of history they may not know and at the same time get Armenians to think out of their traditional boxes and hopefully entertain everyone along the way. What kind of theater speaks to you? What or who inspires you as an artist? : I do have a soft spot for solo shows. There's something really powerful about the personal journey: one person taking the audience on a ride that is inevitably vulnerable, cathartic and deeply personal yet universally moving. I love Sarah Jones. I love how she infuses the political message in a very entertaining yet impactful way. Spalding Gray made an impression on me, I was lucky enough to work with him briefly on a project he was doing for MOMA back in 1991 on High & Low Art where he worked with NYC High School kids. If you could work with anyone youve yet to work with, who would it be? : Uhhhh, everyone great! I love my director and team. Misti B. Wills, April Bartlett, Dan Henry, Kacey Gritters, Danielle Gautier. If I’m going to think big, I can’t avoid mentioning Louie C.K. and I would love to work with Pam MacKinnon. What show have you recommended to your friends? : A fellow solo artist Joe Assadourian has a really compelling solo play called Bull Pen. Also Erin Layton is headed to Edinburgh with her dynamic one-woman show Magdalen. Who would play you in a movie about yourself and what would it be called? : See, that's not fair because there are so few big actresses, luckily I have someone superb who's also big although I'm not sure for how much longer - Melissa McCarthy. The movie would be called "Fat Girls In Love", and by the way, that's my next project. Once I'm done with Fringe... that's the next beast I'm going to tackle. If you could go back in time and see any play or musical you missed, what would it be? : I guess it would have to be the original Who’s Afraid of Virginia Woolf? from 1962. Whats your biggest guilty pleasure? : To show you how sad my life is...watching Rachel Maddow while eating ice cream or pizza... because she's my girlfriend…she just doesn't know it. If you werent working in theater, you would be _____? : Well, I'm not working in theater, I work as a television editor during the day. But if I didn’t have that job and this amazing passion, I would open a restaurant with my mother where we’d serve delicious Armenian dishes. She’s a phenomenal cook. Whats up next? : "Fat Girls In Love"... the movie! Oh and before that, I want to take Shake The Earth to colleges and universities across this great country!